A high quality Aquatec 24v AC pump for boosting water pressure into your reverse osmosis system thereby increasing output, efficiency and even water purity. Suitable for our 200, 300 and 450 GPD Reverse Osmosis units. 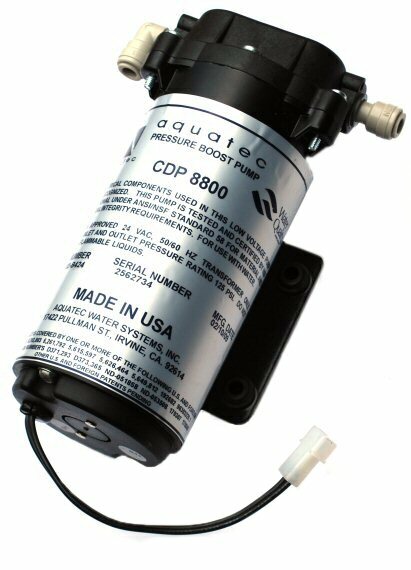 Simply install the pump inline between your prefilters and RO membranes. Water temperature, TDS (purity) and mains pressure will all affect final RO output and quality, however we have tested this pump at our workshops on one of our 300 GPD Reverse Osmosis units with an inlet water temperature of 16C a TDS of 290ppm and a pressure of 50psi. RO output rate more than doubled with the pump installed and the output TDS dropped from 018ppm to 010ppm offering considerable savings on DI resin usage over time. Based on this setup in these conditions the booster pump would reduce the time taken to produce 250 litres of pure water from 14 hours 30 mins to just 6 hours and 15mins. Supplied WITHOUT a transformer for 240V mains power, this item is offered as a spare for those with a transformer.